In an effort to provide Hampton Roads citizens with up-to-date and timely news regarding Hurricane Florence, the Virginian-Pilot, the Daily Press and theVirginia Gazette took down their paywalls on Tuesday so that community members can read their reporting free of charge. 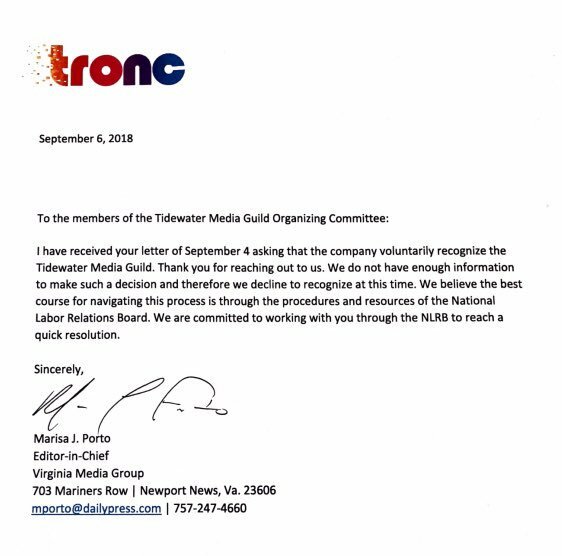 Tronc has chosen not to voluntarily recognize a union formed by its reporters in Virginia. In a letter to the Tidewater Media Guild, executive editor of the Virginian-Pilot and the Daily Press, Marissa Porto, said the company does not “have enough information” to recognize the guild at the current time. The Tidewater Guild currently has signatures from 56 eligible staff members at the Daily Press and Pilot. Joseph Barreto “Brett” Phillips, who founded Leesburg Today and who dedicated a significant portion of his life to Virginia newspapers, died Sunday of lung cancer. He was 76. In 1988, Phillips founded Leesburg Today–a weekly paper he would grow from a circulation of 3,000 when founded to more than 64,000 in 2006 when he sold it. Phillips started his career in Virginia newspapers after attending school at the Virginia Military Institute and George Mason College. He worked as a reporter at the Loudoun Times-Mirror for four years before becoming the paper’s managing editor in 1966 at the age of 25. This past Sunday, the Richmond Times-Dispatch launched a new newsletter aimed at showcasing local startups in the region. RTD’s newsletter, “Richmond Startup Spotlight,” will showcase “success stories, new ventures, patent information, advice and articles of interest to entrepreneurs,” according to a press release from the paper. There will also be columns from area business professionals that offer advice and insight to the startup community. The Virginia Gazette has a new home. Last week, the paper moved into its new office building on High Street in Williamsburg. The Gazette’s new building is single-level with an open-floor plan and mobile work stations. Construction on the new space began last February but the staff was not able to move in until last week.